Weaning can be a messy business. It can also see your once beautifully tidy kitchen accidentally get taken over with endless products, gadgets and mismatched plastic. Keep your kitchen stylish and get them ‘eating up’ with our pick of genius products that work hard and look so great that you won’t mind leaving them out. Choose a highchair that suits the style of your home. That way you won’t mind leaving it out between meals. 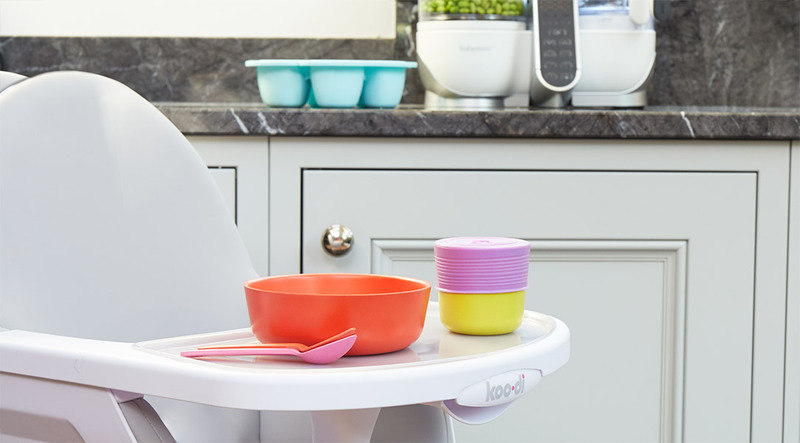 For versatility, we love the Koo-di Duo Wooden Highchair and the BabyBjorn Kitchen Booster Seat. In neutral tones, they’re modern, minimal and comfy. When it comes to food prep, bulky kit and multiple gadgets can cause total worktop take over. An all-in-one products, like the Babymoov Nutribaby Plus is the way forward. It steams, crushes, blends and defrosts as well as heating and sterilising bottles, meaning it’s the only gadget you need. And you can change the covers to match your space. Go simple with plates, bowls and cutlery. Plain colours and designs will work with the other things in your home and won’t look out of place at the grown-ups table. We like the simplicity and design of the EZPZ Happy Mats and bowls, as well as the vibrantly coloured plates from EKOBO. Keep things calm in the kitchen with products that you can store away after use. 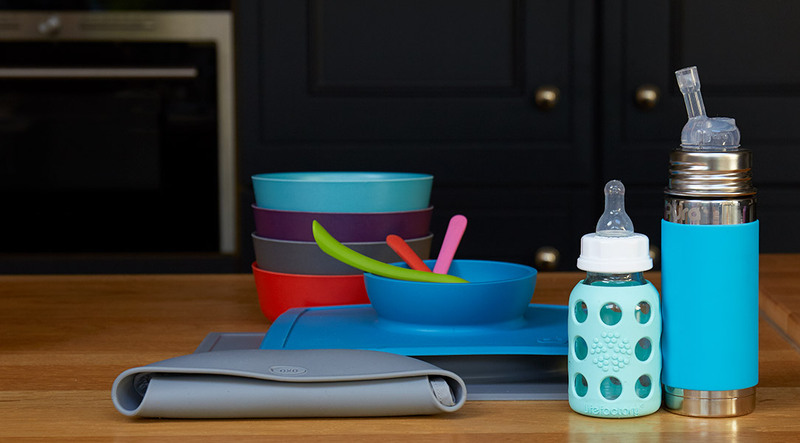 Oxo Tot make feeding bibs that fold into themselves and the grey colour goes with everything. Doodle Bags that are simple food pouches that you fill, use and then store away, are another great option. Enjoyed this collection? If you’re looking for more room inspiration then we’ve curated each room in the house to help and inspire. Take a look at our tips for putting together a mint or natural nursery or a creative play space. Our articles on creating a family living room and bathroom, ensure you have the perfect space that suits you and them.